Foreword by the Rector The Reverend Granville Mercer Williams, S.S.J.E. I PLANTED, Apollos watered; but God gave the increase. So neither is he that planteth anything, neither he that watereth; but God that giveth the increase. So wrote St. Paul to his own Corinthian Church. Any record of a great spiritual achievement must necessarily be confined to the relation of the labours of Pauls and Apolloses; of that more important factor of God's part in the enterprise no man can write, though every man must ever be mindful of it. The history of the Church of St. Mary the Virgin is the record of a great spiritual achievement. And, while we wonder at the faith and courage of a Thomas McKee Brown, the founder of the parish, and the devoted labours of those who worked with him or followed him, neither must we fail to render unfeigned thanks to God as we see how unfailingly His blessings have been poured out on this effort to set forth in its fulness the beauty and glory of Catholic Truth. Through many dangers, through discouragement and doubt and difficulty, God has guided and blessed this parish. God has indeed given to us an abundant increase. It is for us, the present members of St. Mary's, to carry on the great work that has begun here. Our opportunities are great. God will reward our prayers and labours and devotion no less surely than He has evidently blessed and prospered those who have gone before us. Let us all go forward in sure confidence of a glorious future for our beloved parish. By The Rector Emeritus The Reverend J. G. H. Barry, D.D., Litt. D.
LOOKING back at the life of a parish after twenty years is I very much like looking at a moving picture--the difference is that the background is constant and only the characters change. The personnel of St. Mary's when I resigned in 1928 was very different from that which filled the scene when I came to the rectorship in 1909. That is inevitable in any parish, but in a greater degree in a down-town city parish. As I look back many vanished faces reappear to me. There is Miss Clarke whose whole life had been St. Mary's--never, so far as one could find--any other interest. Fr. Brown stood out as the heroic character in her experience and the "old church" as the ideal setting of life. "There are to be new seats in St. Elizabeth's chapel, I hear," someone said to Miss Clarke. She looked at the dilapidated benches and sighed: "Those benches were in the old church." There was Miss Guion, day by day, year in and year out, dusting altars and arranging flowers--a devoted soul if ever there was one. Mr. Beverley Chew comes to mind, a rare emergence from Wall Street, cultured, artistic, devout. Then Mr. Haley Fiske who for all the twenty years was my support and friend. Again a great business man whose life centered in his devotion to Christ and His Church. A great business man--yes; but first of all a great Christian. There are many others that come to mind but these shall suffice to recall the scene of 1909. I came to St. Mary's from a Seminary deanship where I did not want to be, to a parish that I did not want. Circumstances, however, seemed to make it clear that it was my duty to come. As I viewed the situation near at hand, I wanted it still less. What should I do? Set about revolutionizing it? That seemed to me not to be fair. 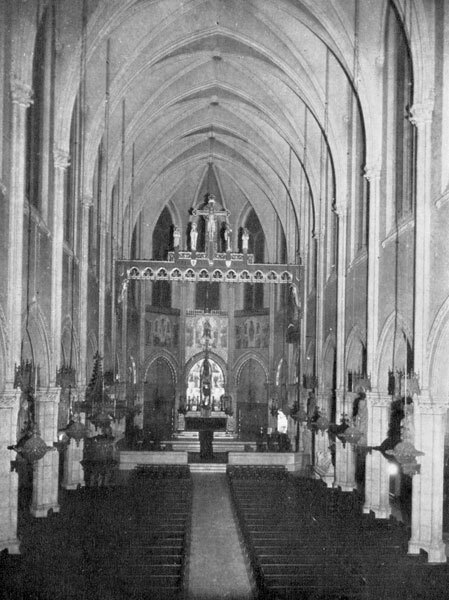 The parish had a distinct tradition from the time it was founded. If that was antipathetic to me I ought not to come. What I had to do was to carry on the tradition as best I could. I had never taken part as one of the ministers in a solemn Mass (and never have). I was afraid [9/10] that my theological position would not fit in. I preferred a different type of music. I was afraid from the reputation of the parish that there would be too many "sanctuary rats" about. Still, if I was to be rector of St. Mary's I must in some way reconcile my ideals with the traditions of the parish. As I settled my policy, after study of the ground, two things were indicated as fundamental; other things were incidental and might be modified as circumstances suggested. The first was that in all preaching and teaching the emphasis should be on the spiritual life of the individual; that the Christian Religion is before all things, not a creed, not a ceremonial, but a life; that creeds and ceremonial are of no sort of value except as they aid in the expression of that life and symbolize it. I think I held consistently to this principle in teaching, in the development of devotions and devotional services so far as my ability enabled me to do so. The second fundamental principle was that the outward expression of devotion through ceremonial and music should be carried to the greatest possible perfection. The services had to be reformed in some minor ways, even at the expense of offending a few. One family withdrew because the celebrant ceased to sing the confession and absolution at High Mass! But the changes here were of not much importance, designed simply to add dignity to the services. Much more important was the change in the character of the music. The music seemed to me very poor. I held, and hold, that in a parish such as St. Mary's, which set out to express the fullness of the Catholic Faith and worship, it is required that this should be done in such a way as to reach as nearly as possible the ideal standard. St. Mary's claimed, I found, that owing to its circumstances, it could, and intended to set an example to the Church of what Catholic worship ought to be. It was more than a parish; from its situation, and its reputation, it influenced the whole American Church. Very well, if that was the case, it must set the highest standard of attainment possible. There were many who objected to the practice--possibly because they did not understand the theory. In the circumstances the choice lay between consulting the taste of individual members of the congregation, or of aiming at the ideal. Concretely stated, that meant whether music should be kept at the standard of taste of John Doe or should try to lift the taste of John Doe to something approaching appreciation [10/11] of the best music available. As I have always held whether in music or devotion or ceremonial my business was to educate and lift and not to let down there was no question in my mind what course to take. I was fortunate in securing in the person of Mr. R. V. Nold a musical director who was able to do in practice what I conceived in theory. I am convinced that the music of St. Mary's under his direction is the finest in the country, as was the ceremonial under the direction of my faithful master of ceremonies, Mr. Ernest Ball. From an attitude of hesitation as to whether I ought to be at St. Mary's experience transformed me to an attitude of great love of the parish and of the people. Looking back over twenty years it is inevitable that one should see that one has made mistakes, but I hope that they have not been of disastrous consequence. These years have been years of experience for which I am very grateful. I have now been a priest for forty-four years, and if I were a young man starting out in life, and, knowing all I know now of the state of the Church, I should have no hesitation in choosing as I chose so many years ago, I believe under the guidance of the Holy Spirit, to become a priest of the Episcopal Church. Life there is a wonderful, and in certain ways a weird, adventure; but there is no other life I would want. This account of the Society of the Free Church of St. Mary the Virgin has been compiled from the official records of the Corporation. In the sixty-three years which it covers many interesting and unusual events are recorded in its voluminous annals, but an attempt has been made to keep this volume as brief as possible without sacrificing any essential of interest. Deriving the information from this source has undoubtedly led to the omission of many interesting happenings because they did not come within the official purview of the Trustees. For the same reason some names have undoubtedly been omitted which should find grateful mention in the following pages. This is to be regretted, and it is hoped will later be corrected. As the official records, being actual histories, describe events solely in chronological sequence, it is also inevitable that certain inconsistencies and apparent inaccuracies, will be found. It may perhaps appear that references to the finances are over numerous. They have been included, not only because the financial position of any Church is the most accurate barometer of its appeal and usefulness, but because, in the case of St. Mary's, they simply cannot be escaped. Founded without money, by men of moderate means, from its very inception the Church waged war against financial collapse that never abated, that could not be ignored for a moment during the first thirty years of its existence. Times out of number it seemed as if nothing but a miracle could save the Corporation that was bankrupt in fact if not in name--and the miracle always happened. While it is no more a part of the object to point a moral than it is to adorn the tale, it seems impossible that anyone can read the story of St. Mary's, its early struggles, its temptations, its dangers and discouragements; started, as it was, with nothing (of a material nature) and carried forward by faith and courage, without seeing evidence of God's presence, God's guidance, God's love and care, as clear as ever they appeared to Apostle or ancient Prophet. This book has been produced under the direction of the Trustees. To all who have helped toward its completion in any way, grateful acknowledgments are made. It is hoped that in spite of omissions, inconsistencies, shortcomings and deficiencies, which are freely admitted and for which regret is expressed, it will prove interesting and will awaken in the memories of some of her many friends, pleasant recollections of St. Mary's.